I'll confess, ayam goreng (Indonesian fried chicken) is undoubtedly the quickest way to my heart, and this recipe in particular is very dear to me. My step-mom Esti was raised in the Sundanese region of Java, Indonesia, eating this style of chicken. She calls it kampung (village) chicken because the ingredients are used fresh and pounded into a pulp with a mortar and pestle. She perfected her own magical interpretation of ayam goreng and cooked it for me growing up. Ours is served with rice, sambal, a raw vegetable salad if we're lucky, and eaten with our hands. It's so delightful I may have dreamt about it once or twice. Like any good chef, mama Esti eyeballs everything, dancing around the kitchen with a nursing baby dangling from her breast, putting dashes and pinches of smelly, spicy, and sweet ingredients into bubbling cauldrons of goodness, and I'll tail behind her franticly scribbling down what seem like generally correct measurements. My attempts at home are never quite right. Finally, we sat down and spent the afternoon carefully writing out and practicing the recipe. This one works. Now that I have it for keeps (and in turn, so do you!) I'll definitely be passing it on to my eventual little ones. I hope you enjoy it as much as my family does. 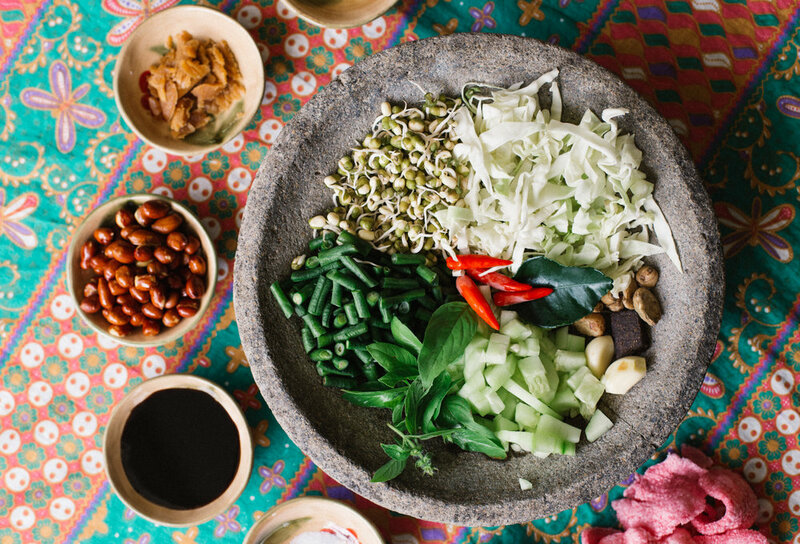 I've also included a recipe for sambal terasi (shrimp hot sauce), and karedok (Sundanese raw vegetable salad with long beans and a spicy peanut sauce) which are perfect accoutrements. You'll need: a mortar and pestle or a food processor. It will be your most trusted companion in this recipe. 1. Blend 3 cloves of garlic, shallot, candlenuts, 1 thumb each of ginger and turmeric, 1 tsp coriander, and 1 tbsp salt in mortar and pestle or food processor until they create a chunky paste. 2. Fill a large saucepan with the chicken broth and water until it's about 1 1/2 inches deep. Add paste and bring to a light boil. 3. Lower heat to medium, add chicken (if they don't all fit, wait until the first round is completely cooked and removed before adding the rest and repeating.) Cook each batch for about 3 minutes, turning the pieces over frequently. Remove from water and drain. They should be par-cooked – no pink showing but still tender on the inside. 4. 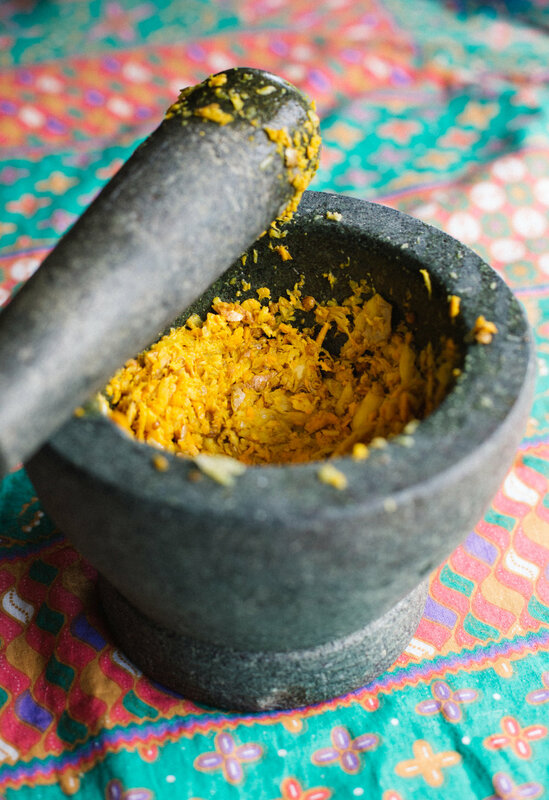 Blend the remaining garlic, ginger, turmeric, coriander and salt in mortar and pestle or food processor until it makes a slightly less chunky paste. 5. Combine chicken and paste in a bowl, mix well, and let sit for about 10 minutes. 6. 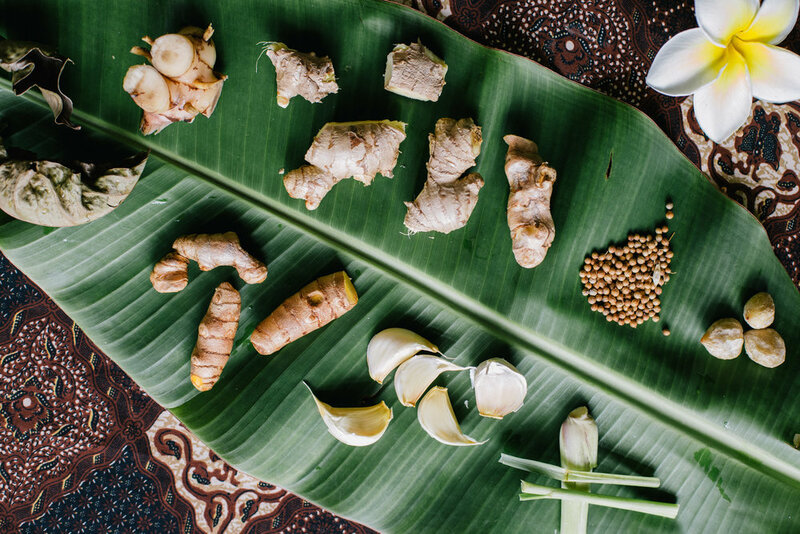 (Optional) For the coconut topping, blend shallots, galangal, turmeric, candlenuts, and salt in mortar and pestle or food processor until it becomes – yes, you guessed it – a chunky pulp. 7. Heat 1 tbsp oil over medium heat in a pan then add the pulp. Sauté, stirring frequently, for about 3 minutes. Add the coconut, bay leaves, and lemongrass and stir constantly until the coconut is an even golden color, about 5 minutes. You may need to turn the stove on low if it toasts too quickly. Set the coconut aside for later. 9. Fry until both sides are golden brown, about 6 minutes. Remove from pan, and drain in colander to remove excess oil. 10. 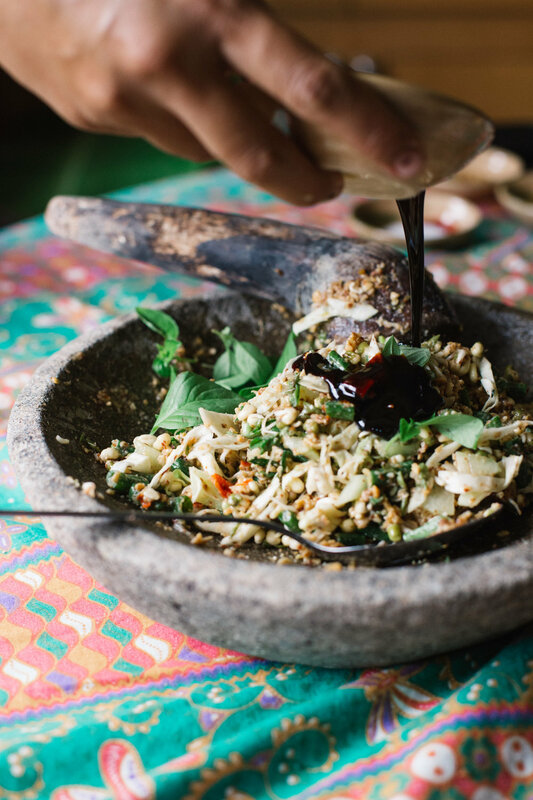 Sprinkle with a generous amounts of toasted coconut, serve hot with rice, sambal, cucumber and tomato.